Even the most casual of observers will notice that cars are getting more efficient. While it's true that the latest internal combustion engine designs yield more power, without using as much fuel, that’s only part of the reason why. Lightweighting, or the process of shedding weight from a vehicle, is also helping drivers stop for gas less often. Two automakers who have been helping lead the charge in this area are BMW and Lotus. 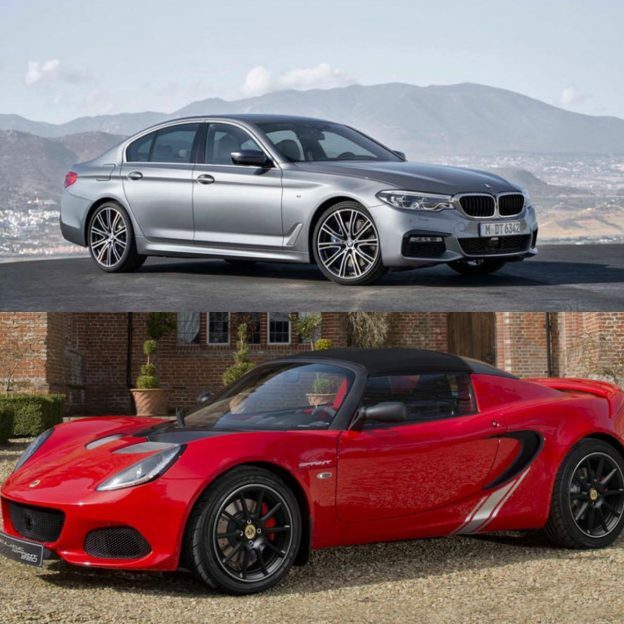 BMW and Lotus are two automakers currently pushing the boundaries of lightweighting. Lotus has a long history of "adding lightness" to its cars, with the aim of making them nimbler. This philosophy was originally introduced by Colin Chapman, the founder of Lotus. As a result, the approach of finding ways to shed weight from a vehicle is ingrained in everything the automaker does. This push to keep things lightweight has made Lotus a true industry leader in composites, glues, bonding, and the use of aluminum. Back in 1995, the company wowed people with the Elise, which tipped the scale at under 1,600 pounds. Among the innovations the car introduced was an aluminum chassis bonded with epoxy, a technique that's been adapted by virtually every automaker to one extent or another today. The Elise matched or surpassed the competition in many ways. The chassis was exceptionally rigid, even though the car had no roof, which made it a blast to drive on twisty roads. While many people associated aluminum with cans that crush easily, the Lotus met more stringent European crash standards handily, proving that lightweight doesn't have to mean unsafe. Today, Lotus is still pushing the boundaries of lightweighting. It uses various composites for vehicle parts, netting amazing results. What's impressive is that the company occupies this leadership position, even though until recently it has been in dire financial straits. To address this, Lotus has been churning out plenty of special editions for its different models. Engineers find many ways to shave down the weight of the cars, paying attention to sometimes the smallest details to lose just a few more grams. As a result, performance rises noticeably, proving that shedding weight here and there pays off. A prime example is the Lotus Exige Cup 380. The Exige is a quick car, but this version pushes the vehicle to a 0-60 time of just 3.4 seconds, versus 3.9 seconds for the regular Exige. To get there, the company trimmed down the curb weight to just over 2,300 pounds. Achieving that kind of lightweighting success comes with multiple innovations. One is a carbon tailgate made of a single piece of material, which dropped about 14 pounds. Engineers dropped the gas struts used on the regular Exige, which saved just over 1 pound of curb weight. The list of lightweighting innovations is long, and the attention to detail is impressive. BMW hasn't become an automotive powerhouse by accident. The German brand constantly pushes the boundaries of innovation, which today incudes lightweighting. To say BMW has a love affair with carbon fiber would be a huge understatement. The company realized years ago that using the composite in more of its vehicles would lead to solid results. Others thought the plan was foolish. After all, carbon fiber was something you only saw on McLarens, Lamborghinis, and other exotic cars. In 2010, BMW teamed up with SGL, a leading carbon-based products manufacturer, to establish a carbon fiber plant in Moses Lake, Washington. The whole point of the facility was to drive down production costs. Managers learned from Henry Ford and Andrew Carnegie that using a vertical integration strategy to make carbon fiber was more affordable. This approach works. Taking things to the next level, in 2015 BMW opened the largest carbon fiber parts plant in the entire world. The facility makes components for the 7 Series, which was completely revamped that year. As a result, the 2016 7 Series gained quite a few pieces of equipment, without government fuel economy ratings taking a hit. Most people just pass over the BMW i3 without giving the car much thought. After all, it doesn't boast the longest driving range (if you don't get the range-extended version) and it looks weird. What people don't know is that the little electric car has helped pave the way for the future of lightweighting. The i3 was the first mass-produced car to use a composite frame. Lightweighting techniques go from there, like the passenger compartment that's made of dry carbon non-crimp fabric (NCF), resin transfer molded (RTM). According to BMW, the composite passenger compartment alone saves 770 pounds, when compared to a traditional structure made of steel and aluminum. Many other manufacturing innovations are rolled into the i3, making it a truly fascinating vehicle. It's influencing how future BMWs are made, as the company stretches to meet efficiency goals, without compromising performance. As time rolls on, automakers will continue to push ahead with lightweighting methods. For example, BMW teamed up with the University of Delaware-Center for Composite Materials to develop a more lightweight B-pillar. The structure is a thermoplastic and carbon fiber composite, and could boost crash test performance. This flies in the face of some fears that lightweighting will make cars less crashworthy and more dangerous. More innovations are coming down the pipeline. This is an exciting time because we get to witness the creative lightweighting solutions BMW, Lotus, and others develop. Are you a car enthusiast yourself? Check out some of the awesome car models found on the GrabCAD Community Library.